NELSON AT MERTON A free information leaflet was produced by Merton Historical Society for Trafalgar 200 celebrations. A printable copy can be downloaded here. Horatio Nelson (1758-1805) bought Merton Place in October 1801. His lover Emma Hamilton had negotiated the purchase while he was at sea. In 1802 he added considerably to the grounds by buying the adjoining Merton Grange estate. He lived at Merton Place with Emma and her husband Sir William until Sir William’s death. When Nelson returned to sea in May 1803 Emma stayed on at Merton. In August 1805 Nelson came home for 25 days before departing for Trafalgar and leaving his “dear, dear Merton” for ever. It was at Merton that Emma received the news of the battle and his death. Merton Place stood south of Merton High Street, where there is now a plaque on a block of flats. Emma’s debts forced her to try to sell the house, but she failed to find a buyer. Finally a consortium of friends arranged the purchase, but it was never lived in again and was pulled down by 1817. Several local roads and pubs have names associated with Nelson. The Society has published two booklets relating to Merton Place, listed on the right. 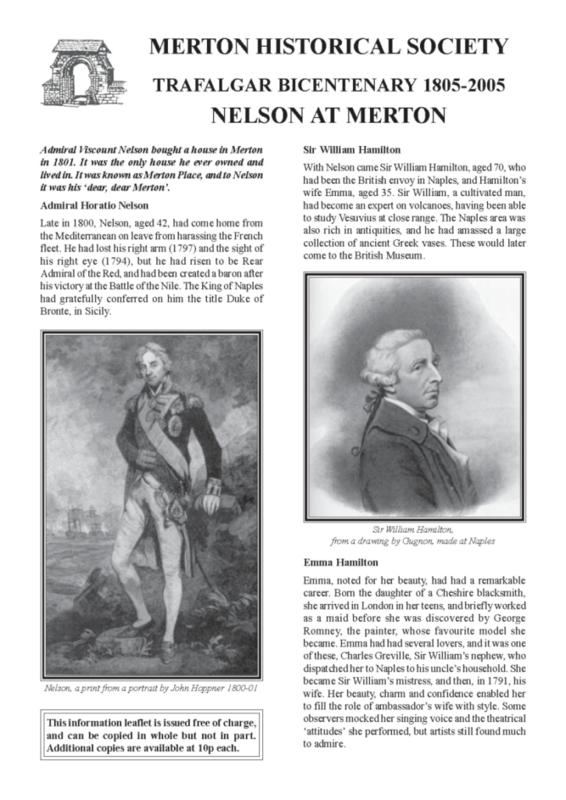 Merton Library Service has produced The Nelson Trail – A visitor’s guide to Lord Nelson and his Merton connections. You might also like to visit: www.brereton.org.uk/brinton/mertonplace.htm, with collected transcriptions of advertisements from The Times of 1800-1824 relating to Merton Place and its estate. They are mostly concerned with sales of property, building materials and house contents, but one includes details of ‘Nelson’s new Patent SIDEBOARD and DINING-TABLE united in one handsome piece of furniture’ by Morgan & Sanders, ‘Inventors and Manufacturers’.